The title of this paper refers to a subject matter that is already being dealt with by many able scholars, for some of whom it is a central preoccupation. 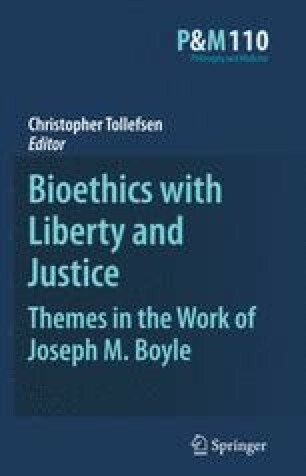 The issue of justice in health care has also been an abiding concern of Joseph Boyle (see, e.g., Boyle, 1977, 1996, 2001). In essays ranging over some 30 years, he has defended a right to health care in developed nations, and has addressed some of the difficulties that arise in a context of finite resources and moral pluralism. In this essay I shall only propose some ideas that I hope will be helpful to Boyle and others who wish to contribute to the ongoing debate on these matters.